The home of Guy Dearden’s music. 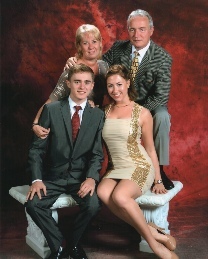 Pictured is Guy Dearden and his family. Guy was born in North Manchester, England in 1956. He started to play piano at the local dancing school in Oldham at age 13 where his younger sister attended. His love for theatre music and playing for dancers developed here where he played for many ISTD modern, tap and ballet exams. In these fairly early days of modern and tap syllabi Guy worked with the great pioneers of days – Murielle Ashcroft, Mary Archbut and Marianne Jepson to name a few. Later on as a freelance pianist Guy played for hundreds of schools all around Manchester and beyond. He remembers once while playing for ISTD Modern exams at a dance school in Stockport another pianist was waiting in the changing room and was listening carefully to his playing. She commented to Elaine Croft, the principal of the school – “This is how my music should be played”. It was none other than Catherine Barlow (Katie), who composed all the ground breaking ISTD Modern music working along side Mary Archbut. A great compliment indeed! Guy established his reputation as a dance accompanist and became the Centre pianist for both the Manchester and Leeds ISTD Dance centres. At the same time though Guy was gaining more experience playing for many more dance societies – RAD, IDTA, BBO, NATD. Guy played and recorded the original tap grades music for the ISTD, carefully selecting the very best tunes for each exercise with his good friend Gillian Farr who he had the pleasure of meeting on numerous exam sessions. Guy also played and recorded the ISTD adult popular tap test music working with another great pioneer of dance – Marianne Jepson at her dance college in Oldham. The Grand Hotel, The Portland Hotel, Ramada Renaissance and the Hilton. He toured with the Syd Lawrence breakaway band “The New Millionaires” under the direction of Nat Whitworth and was accompanist on stage with Bob Monkhouse, Max Bygraves and The Bachelors. He played for Frank Finlay’s birthday party in Bolton and even for the now famous Jennifer Ellison’s tap exams in St Helens at the Elizabeth Hill’s school of dancing. He played in the cabaret band for Cunard Cruise lines in 1981 where he met Jessie Matthews – “at last I’ve found someone who can play” she said – and was invited to her cabin for afternoon tea along with the girl dancers. In 1991 Guy married his wife Rosemary (Ex Northern Ballet Theatre Dancer). They have two children (Grace and Ashley) and have settled down in their new life in Spain. Guy continues to play for exams in Spain and Gibraltar and produces music for dancers and singers throughout the world.